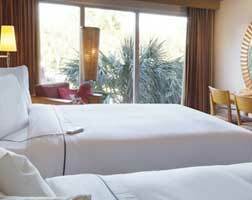 The accommodation at the Radisson Resort Orlando Celebration consists of 718 guest rooms and suites. All come with custom-crafted Italian furniture, bathrooms with granite and marble finishes, complimentary high-speed internet, HD flat-screen TVs, in-room safe, with cribs available for younger ones. You’ll also have a hairdryer, iron and ironing board, online movies, a fridge and roll-away beds as required. Accessibility features in the 22 specially-adapted rooms include roll-in showers, Braille signage, wheelchair access like wider doorways, and other adapted controls, in the bathroom, for example. Standard rooms are available with the choice of either two double beds, or one king-sized one. Then, there is the option of a ‘Sleep Number’ room in the same two formats. Here, however, you’ll rest very easy on a special bed with adjustable air chambers in the mattress. With the touch of a button, you can decide on just the right degree of firmness. The suites come with a separate bedroom, with a choice of two double beds, or one king-sized. You’ll find a sofa bed in the seating area..